Farm bill vote: Was the food stamps separation a missed opportunity? Opening Act: Maybe Just Let the Poor People Collect Farm Subsidies? 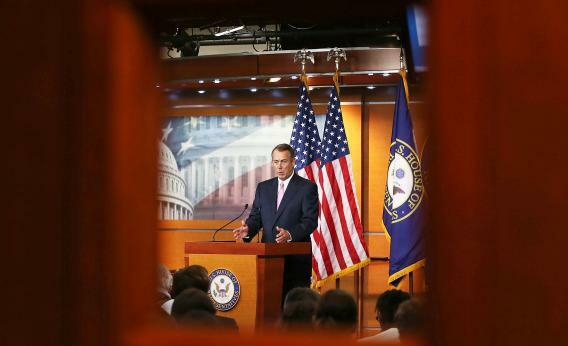 House Speaker John Boehner, (R-OH) vanquisher of food stamps. Good news, everyone! The cost of the student loan fix is sapping its support in Congress. Eliot Spitzer wrote a column for this site in 2012 about why he was voting for Barack Obama, then apparently didn’t vote. Perry Bacon welcomes Cory Booker to the Senate, a bit early. Daren Bakst explains why, from a conservative perspective, the “split farm bill” was a wasted opportunity. The process House Republicans used to get this 600-plus-page bill to the floor in a mere 10 hours essentially violates their own promise to conduct business in an open and transparent manner. They prohibited legislators from introducing amendments. And, they played a game of bait and switch by claiming this bill was the same text from the failed House farm bill of a few weeks ago. This, about the farm bill, is probably the ne plus ultra of winner/loser analysis. Marin Cogan walks you through the midnight conflict between Bobby Jindal and David Vitter. Dave Zirin defends Oday Aboushi from some nakedly racial smears. Paul Krugman is unsurprisingly unconvinced that “libertarian populism” will save the GOP. Correction, July 12, 2013: This post originally misspelled Daren Bakst’s first name.